Reigning @WPT Rolling Thunder champ David Larson is among the players cashing in 16-24th place in today's #WPTDSThunderValley OneDay$100K. 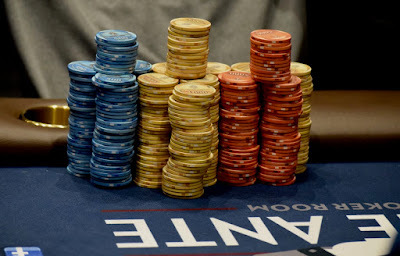 Next steps up the Pay Ladder shell out $2,367 for 13-15th place, $2,844 for 10-12th place, then the tourney moves to single-place payouts for 1st-9th place, with $33,587 FTW. 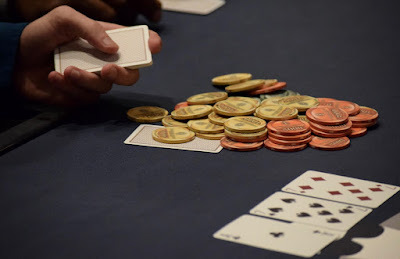 In the BB for 24,000 with just 4BB behind, Jeremiah Niccum moves all in dark over a preflop raise and tables Five_Seven. 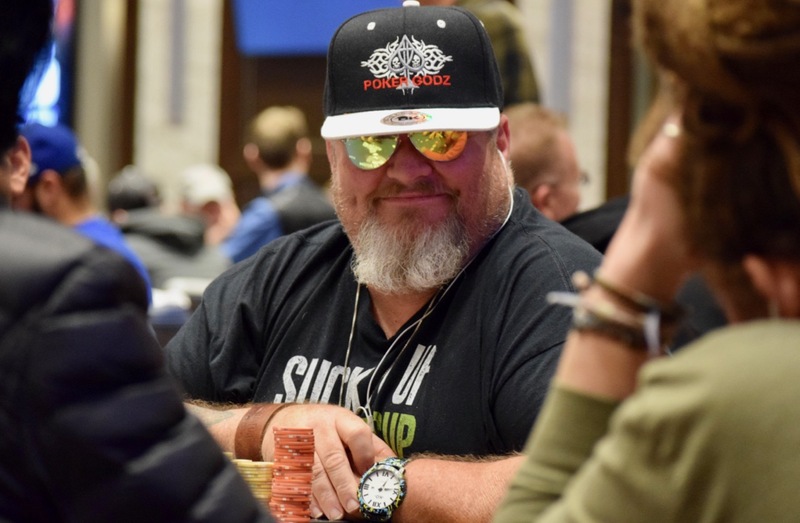 The board goes 8-9-T-J and Niccum - who hit quads on the money bubble to survive - gets a late-night double with 15 players left to build back to almost 300,000. We withheld the name and hand of the challenger to protect the innocent. 26 players remain #WPDTSThunderValley OneDay$100K and Paul Kuchta's stack is double 2nd place here in Level 20. Here's the final 26 players, in seat-position order at the three-table redraw, with player-provided chipcounts. A three-way all-in postflop #WPTDSThunderValley OneDay$100K with Chris @rukidingme44 Hinchcliffe ahead, another player with a gutshot straight draw, and Greg @Zarrdogg White holding TopTop plus a flush draw. Here's the first batch of payouts in the OneDay$100k - Event 2 in the #WPTDSThunderValley Series, players cashing for $723-$822. Next step up the Pay Ladder is to $921, with tonight's winner earning $33,587 and an added $560 Grand Opening Celebrity Bounty seat. When last we saw David Larson, he had every @WPT Rolling Thunder tournament chip in front of him, collecting $295,128 while joining the @WPTChampionClub. Larson returned today for #WPTDSThunderValley OneDay$100k and his #RunGood continues, up to 272,000 with 46 remaining. The final 52 players in #WPTDSThunderValley OneDay$100K are in the money. 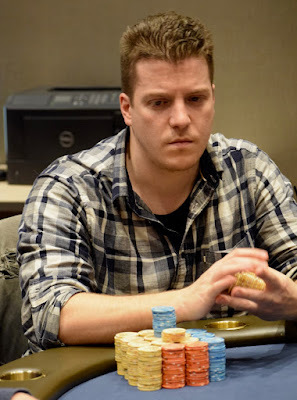 Jeremiah Niccum made the money because he climbed back from a huge AQ < AK deficit preflop by turning quads to survive. 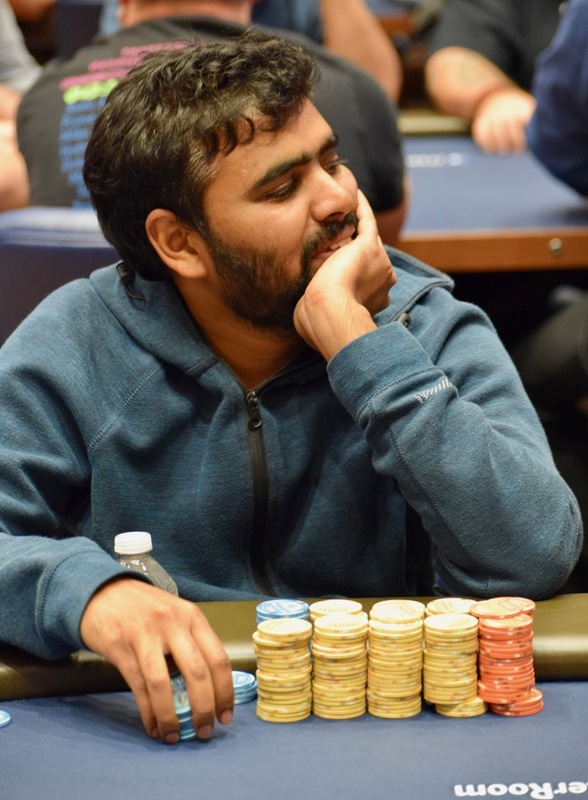 Here's the video of that hand's action, 2 hands before the field made the cash. 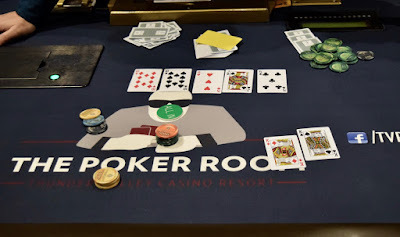 Today's $285 Fast Cash Bankroll Builder drew a 90-entry field, giving the top 11 players $2,000 each in this $22,500 prize pool tournament. Here's the scheduled payouts for today. Four from the money in #WPTDSThunderValley OneDay$100K and here's some of the top stacks in the room, led by the 480,000 stacks of Paul Kuchta (above), and Wilson Chan (middle) with the 360,000 of Sriram Varanasa (bottom) among the leaders. 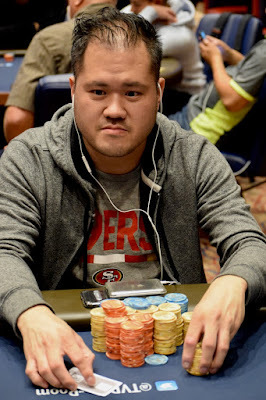 Greg @Zarrdogg White is on a multi-level heater today in #WPTDSThunderValley OneDay$100k. At 210,000 through 12 levels, he's added 150k more since then, a bunch of that a few hands ago after opening for 10,500, having the SB shove for 50k and White snapped him off. Make sure to purchase your entry early for Wednesday's #ThunderBuddies $560 Grand Opening Celebrity Bounty #WPTDSThunderValley to take advantage of all this event has to offer. there's a Bounty at each of the first 11 tables in action on Wednesday, so be one of the first 99 to ensure you have a Bounty at your table to start the tournament. Also, the first 100 players to enter all receive autographed copies of Mike Sexton's book, "Life's a Gamble." The book is available at the Tuesday night bounty players reception at High Steaks Steakhouse. Speaking of Tuesday, a scramble golf event is also available at 9am Tuesday at Whitney Oaks for bounty entrants. 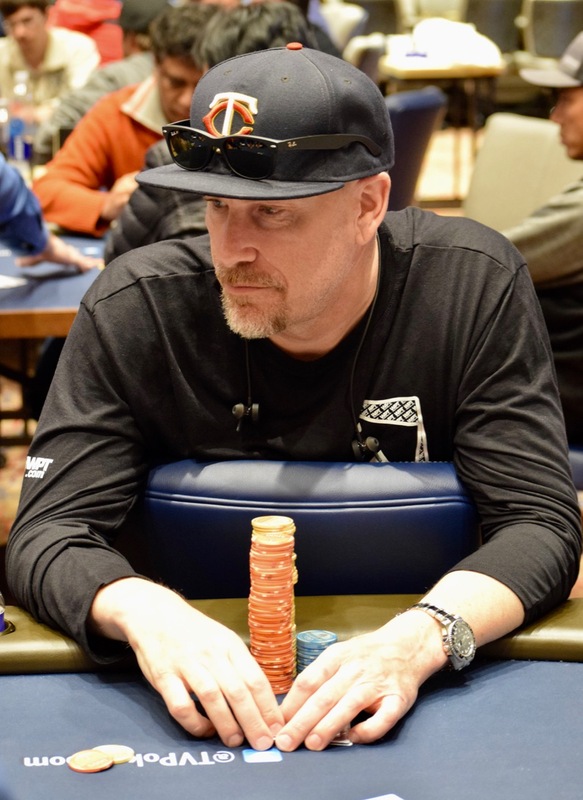 Bounties are on the heads of WPT Founder Steve Lipscomb, Matt Savage, Lynn Gilmartin, JC Tran, Tyler Patterson, Rep Porter, Lon McEachern, Jeff Fielder, Rex Clinkscales, Allen Kessler and Justin Hammer. 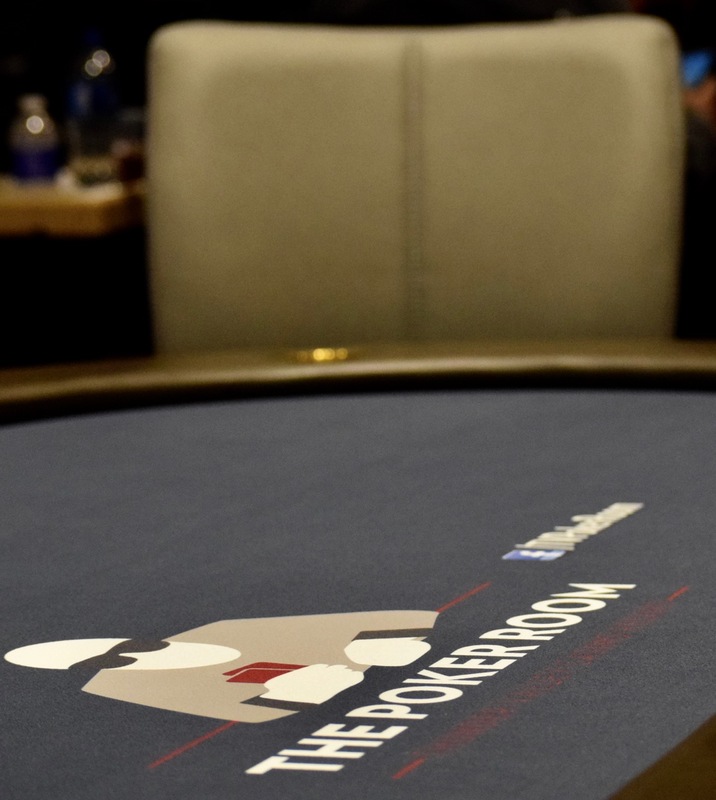 Registration is available 24/7 at the cashier's cage inside TVPokerRoom. Go here for more tournament information. 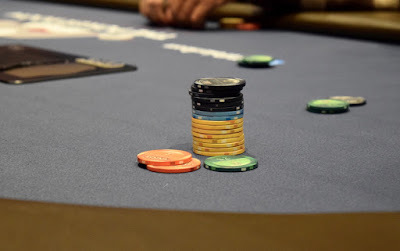 OneDay$100K players are on an extended break, so we took time to gather a handful of chipcounts from around the room in Event 2 of the #WPTDSThunderValley series.